The MACD indicator (Moving Average Convergence Divergence) was developed by a fellow named Gerald Appel. It is one of the simplest and most reliable indicators available. MACD-uses moving averages, to include some trend-following characteristics. These moving averages are turned into a momentum oscillator by subtracting the longer moving average from the shorter moving average. The resulting plot forms a line that oscillates above and below zero, without any upper or lower limits. The most popular formula for the "standard"-MACD is the difference between a security's 26-day and 12-day Exponential Moving Averages (EMAs). Appel and others have since tinkered with these original settings to come up with a-MACD that is better suited for faster or slower securities. Using shorter moving averages will produce a quicker, more responsive indicator, while using longer moving averages will produce a slower indicator, less prone to false readings or whipsaws. MACD-measures the difference between two Exponential Moving Averages (EMAs). A positive-MACD indicates that the 12-day EMA is trading above the 26-day EMA. A negative-MACD indicates that the 12-day EMA is trading below the 26-day EMA. 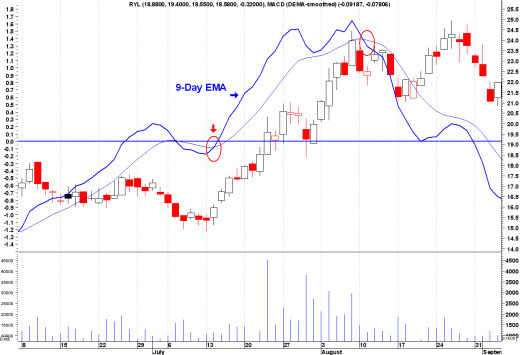 If-MACD is positive and rising, then the gap between the 12-day EMA and the 26-day EMA is widening. This indicates that the rate-of-change of the faster moving average is higher than the rate-of-change for the slower moving average. Positive momentum is increasing, indicating a bullish period for the price plot. If-MACD is negative and declining further, then the negative gap between the faster moving average (blue) and the slower moving average (red) is expanding. Downward momentum is accelerating, indicating a bearish period of trading. A-MACD centerline crossover occur when the faster moving average crosses the slower moving average. For further in-depth information on the MACD Indicator, this resource contains critical information to help you learn to use stock charts and technical indicators in a clear, simple and concise manner to improve your trade entries and exits. A Positive Divergence occurs when-MACD begins to advance and the security is still in a downtrend and makes a lower reaction low. MACD-can either form as a series of higher Lows or a second Low that is higher than the previous Low. A Negative Divergence forms when the security advances or moves sideways, and the-MACD declines. The Negative Divergence in-MACD can take the form of either a lower High or a straight decline. Divergences are probably the least common of the three signals, but are usually the most reliable, and can warn of an impending peak or bottom. 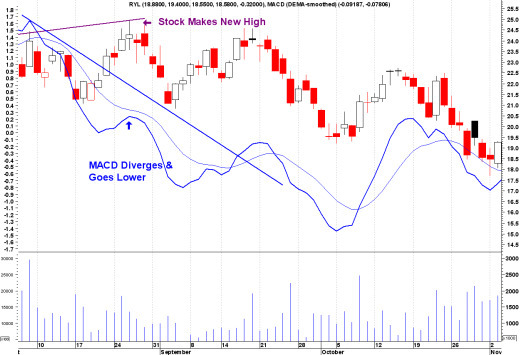 As seen in the chart above, the stock makes a new high in late August, however the-MACD diverges and heads lower. As seen, the share price drops from $25 down to about $18. The most common signal for-MACD is the moving average crossover. Not only are these signals the most common, but they also produce the most false signals. As such, moving average crossovers should be confirmed with other signals to avoid whipsaws and false readings. A Bearish Moving Average Crossover occurs when-MACD declines below its 9-day EMA. A Bullish Moving Average Crossover occurs when-MACD moves above its 9-day EMA, or trigger line. As seen in the chart above, in mid-July, the stock hits a bottom of about $15. A few days later, a moving average crossover occurs, and sure enough, the share price begins to climb. A Bearish Centerline Crossover occurs when-MACD moves below zero and into negative territory. This is a clear indication that momentum has changed from positive to negative, or from bullish to bearish. A Bullish Centerline Crossover occurs when-MACD moves above the zero line and into positive territory. This is a clear indication that momentum has changed from negative to positive, or from bearish to bullish. After a Positive Divergence and Bullish Centerline Crossover, the Bullish Centerline Crossover can act as a confirmation signal. Of the three signals, moving average crossover are probably the second most common signals. Is there a specific MACD Strategy or Technique that you use, that is not described on this page? 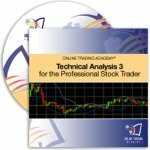 Here is your opportunity to share your MACD Indicator expertise and technique, to help and coach other newbie Stock Traders become more proficient and confident on their journey to Stock Trading Success and Profitability! Return from "The-MACD Indicator" to the Home Page: "Stock Market For Beginners"